You KNOW you love this classic stoner movie! 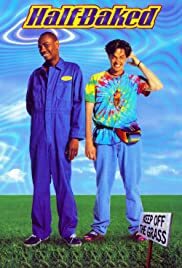 Half Baked hit theaters in 1998, it was the end of the 90’s, and the beginning of the careers of Dave Chapelle, Jim Bruer, and Guillermo Díaz. Veteran comics and stoners like Tommy Chong, Willie Nelson, Bob Saget, and Steven Wright joined newcomers like Snoop Dogg, Jon Stewart, and Tracy Morgan at the right time in all of their careers, to form a great all-around cast with roles and jokes that still hold up after all these years. Now, almost 20 years after Half Baked, Chapelle and Bruer have cemented their names in the comedy hall of fame with their stand up specials, tv shows, and movies, and Diaz has gone on to have a successful career of his own, with standout appearances on The Chapelle Show, Weeds, and Scandal, to name a few. Give it another play, cuz the Dr. says you have a Backiotomy and the only prescription is more Half Baked!